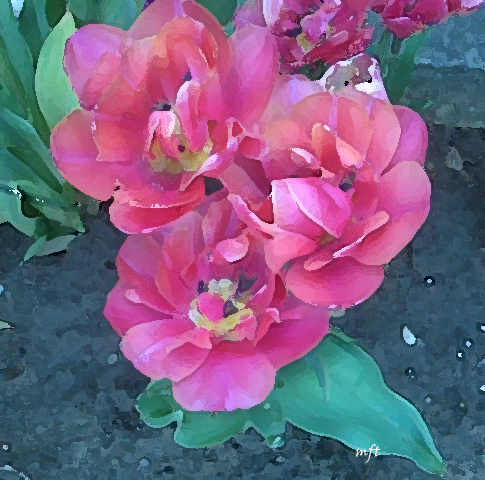 I used Adobe Photoshop to edit these pretty flowers with "Paint Daubs." Wow! Adobe Photoshop turned you into an artist! How lovely! Great job Mary. A creative Ruby Tuesday once again. numbers 13, 14, 15, & 16....thanks. come visit me at Mountain Mermaid! please turn off the word verification thingy! It's fun to play in Photoshop, isn't it? Wish I had more time for it. Lovely paint effect on your ruby red flowers, Mary. I like this Mary. Great job! Looks like a beautiful water color. Looks like a watercolor, Mary. Great editing. You have turned it in to an amazing work of art! This looks like an impressionist painting. It's really look like painting! Quite a lovely treatment of very pretty flowers! The effect is perfect here - well done ;-) Could be used as postcard etc. Beautiful pictures, I love those pretty colors. That is a very jolly technique, which made the tulips look so different. dear mary t...well i must say i am a day late in posting ruby tuesday but i did start it yesterday and finally finished it today...in welland our oldest highschool burnt down and so i waited for the best you tube video and i think i found it! second day of summer and oh the beauty of it!! I guess that this makes my paintings obsolete. This photoshopped floral is lovely! Fun to join in the "Ruby Tuesday" RED fun! Check out my niece's Rube RED VW bug!